The current geological epoch is characterized by the fact that the human species has become the principal geological and biological force on Earth. This global change is driven by the development of technology, agriculture, industry, urbanization, the systemic use of coal, oil and natural gas as energy sources and their convergence. As seen in “The planetary crisis rules, part 1”, this planetary change is qualified as being the “Anthropocene”, in order to explain that a new geophysical era has started, defined by the fact that the human species has become the main geological and biological force of the Earth-system (Jan Zalasiewicz, Anthropocene: a new epoch of geological time?, 2011). A fundamental fact is that the human species has evolved through the invention of a singular way to live, known as “politics” in the set of conditions that emerged from the Pleistocene and the Holocene geological epochs (Jared Diamonds, Guns, Germs and Steel, 1997). However, this immense and irreversible change implies that humanity has altered the planetary life conditions upon which it depends, thus triggering the cascading emergence of new and self-organizing environmental conditions (Thomas Homer Dixon, The Upside of down, catastrophe, creativity and the renewal of civilization, 2006). As a result, the fundamental political and strategic question that arises is to know if the human modern societies are able to adapt to these very new and unknown planetary conditions. Meanwhile, we should wonder about the effects of the Anthropocene on societies’ security. We shall start by studying if the Anthropocene can be “absorbed”, i.e. controlled, by the current security means of a modern and powerful state, the U.S.. This will lead us to ask if it is possible to turn the new planetary epoch into a strategic asset, looking at the example of Russia and the Arctic. Finally, we shall have to wonder if the Anthropocene is not violently challenging the very basics of the modern societies. The Gulf of Mexico is a very interesting place to study, in order to understand if, and how, the Anthropocene challenges, or not, the development of modern societies. Since 2005, the Gulf of Mexico has been the theatre of two major “long” and extremely complex catastrophes, with the destruction of New Orleans by Hurricane Katrina and, in 2010, the giant oil spill following the explosion of the Deepwater horizon oil rig (Cutler J. Cleveland, “Deepwater horizon spill”, The Encyclopedia of Earth, 15 October 2010). These catastrophes are intrinsically rooted in this new reality defined by the transformation of the Earth system by human power. 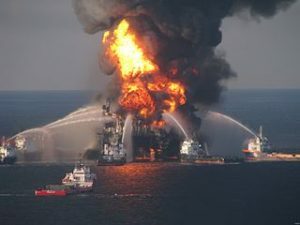 In effect, on 20 April 2010, the BP Deepwater Horizon Macondo oil rig partly exploded, then sank, triggering the largest oil spill in history(Cleveland, ibid). The scale of this oil spill was such because the under sea oil well was uncapped by the explosion. 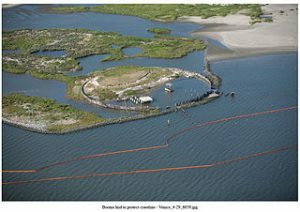 It took three months for the BP engineers and the Navy teams to be able to “plug” the spill. In the meantime, roughly 5 millions barrels of oil flowed in the waters of the Gulf of Mexico (The Navy’s response to the Deepwater Horizon oil spill, 2011). The giant oil spill, both over and under water, covered the littoral of Louisiana, Florida and Texas. 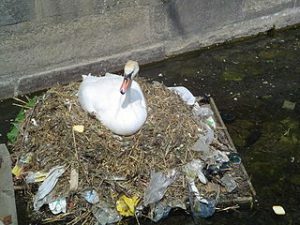 It contaminated the giant wet zone of the Bayou, destroyed entire natural habitats and poisoned the fish, the birds and the whole food chain from sea to land (Naomi Klein, “A hole in the world”, The Guardian, June 20, 2010). Thus, it destroyed the fishing industry of Louisiana, and, with it, whole systems of economic, social and cultural relations, which were dependent on the good health of the Gulf of Mexico ocean water and of its littoral wet zones (DahrJamail, “BP’s widespread Human health crisis”, in Al Jazeera, October 27, 2013). the oil spill, while supporting the effort to “plug” the “hole in the world”, using chemical (and, alas, very pollutant) dispersant (Jamail, ibid). Nonetheless, the spill ravaged the coast and massively seeped into the ecosystems and the littoral societies. Despite its large deployment, the U.S. Navy was barely able to contain a fraction of the oil spill. In the same time, this “American Chernobyl”, as it was dubbed (Carl Pope, “America’s Chernobyl?”, Huffington Post Green, May 25, 2011), became an ongoing global TV show, part of the current media culture and exposing totally unexpected and deep vulnerabilities of the United States. These months of uninterrupted images were proposing a new kind of perspective on this country, as an intricate system of ocean, wet zone, social organization, military power, industry and pollution, each of these elements being parts of a greater system, which included all these elements. In other terms, in a less than five years sequence, the Gulf of Mexico went through singular catastrophes. 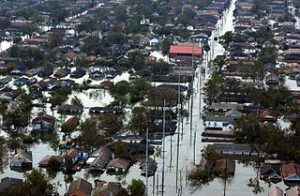 The Katrina catastrophe has its origin in the combination of the violence of the hurricane with the non-repaired flaws of the dike system (Valantin, “Hyper siege: climate change versus U.S National security”, The Red Team Analysis Society, March 31, 2014. The Deepwater horizon disaster is based on a flawed industrial system of underwater oil exploitation. In both cases, the artificial systems of environmental management failed. The catastrophes themselves were the exponential and unstoppable hybridation of the environment and of the human artificial life conditions (Bruno Latour, Nous n’avons jamais été modernes, 1991), which is at the very heart of the concept of Anthropocene. This brutal hybridation creates an anthropogenic new environment, paradoxically hostile both to human and non-human forms of life. Stopping these hybrid catastrophes and reinstating a control on both society and the environment, i.e. rebuilding the dikes and pumping the water out of the city in one case, and “plugging” the oil spill in the other, necessitated massive amounts of security, military, industrial, financial and political resources (US Government, Deep Water: The Gulf Oil Disaster and the Future of Offshore Drilling – The Report of the National Commission on the BP Deepwater Horizon Oil Spill and Offshore Drilling, 2011. What is deeply worrying with these two case studies is to realize that, in 2015, there were more than 377 oil rigs in the Gulf of Mexico (“U.S Gulf of Mexico share of global active off shore rigs declines since 2000”, U.S Energy Information Agency), while the area is scoured by a growing number of hurricanes, which are going to be increasingly frequent and powerful, thanks to anthropogenic climate change. One may only wonder what would happen if several oil rigs were badly damaged at the same time. As suggested by the case studies, the means to manage a disaster on such scale most probably do not currently exist. Thus, it appears that this deeply “anthropized” area is under grave danger, because one can wonder if it will be possible to control the possibly coming hybrid catastrophes, if they are more important than the two presented above. In other terms, modern societies and their political authorities, especially governments, seem to be neither prepared, nor adapted, to the new “anthropo-planetary” reality, which has unfolded since the start of the industrial revolution. However, some actors have started developing a growing understanding of this new reality, attempting, in the meanwhile, to turn it into a strategic advantage. It is especially the case for the security and military authorities. For example, the Russian ministry of Defense has launched a massive program for militarizing the warming Arctic (Valantin, “The Arctic, Russia and China’s energy transition”, The Red Team Analysis Society, 2 February 2015), through the creation of an Arctic military command and of a new military fleet, including the building of new icebreakers and of a new submarine fleet (Trude Pettersen, “Russian Arctic command from December 1st”, Barents Observer, 25 November, 2014; “Russia’s sideways “oblique icebreaker” sailing has final trials“, Russia Today, 2 February 2014; Globalsecurity.org, Project 935/Project 955 Borei). In effect, because of climate change, the Arctic is quickly warming, turning huge gas, oil and other minerals into resources, which can be exploited, even if the region remains an extreme environment. So, as it happens, for the Russian ministry of Defense and for the Russian industries, which develop arctic projects, anthropogenic climate change can be turned, through a specific strategy, into a Russian power multiplier. In the same time, the Russian political authorities have largely evolved from the Soviet Era with its complete political disregard for the consequences of industrialization on the environment. In fact, the oil and gas infrastructure of the country has been through a profound program of repairs that started in 2000, in particular for efficiency reasons (Marin Katusa, The Colder War, 2015). Since then, the protection of the environment has started to become an important issue for the authorities, even if important progress remain to be made. In other terms, the Russian government has a deep understanding of what the Anthropocene means, and these military and industrial responses are its way to adapt Russia to the new planetary reality. Towards crises of unprecedented scale? As we saw with the two previous examples, the emergence of the Anthropocene is renewing the way modern societies are and will be able to anticipate and to handle the coming new kinds of risks and crises. This is even truer considering the gigantic scale of some of these crises, as we shall now see. 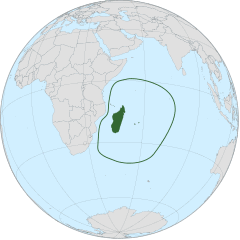 Such a mammoth crisis may well be currently unfolding in the western Indian Ocean rim. A recent study shows that an alarming loss of more than 30% of the phytoplankton in the western Indian Ocean took place over the last 16 years (Koll Roxy and al., “A reduction in marine primary productivity driven by rapid warming over the tropical Indian Ocean”, Geophysical Review Letters, 19 January 2016). This loss is most certainly due to the accelerated warming of the surface water, where the phytoplankton lives. This warming is blocking the mixing of the surface water with deeper and cooler subsurface waters, where the nutrients of the plankton – nitrates, phosphates and silicates – come from and remain blocked (K. S. Rajgopal, “Western Indian Ocean phytoplankton hit by warming”, The Hindu, 29 December 2015). The problem is that plankton is the foundation of the whole ocean feed chain (Callum Roberts, The Ocean of life, the fate of Man and the Sea, 2012). For example, the researchers unveil that there is a massive decline in the shoals of fish near the Kenyan and Somali coast. These declines are not solely the results of overfishing, but of the combination of this practice with the loss of plankton (David Michel and Russel Sticklor, “Plenty of fish in the sea? Food security in the Indian Ocean”, The Diplomat, 24 August 2012). This trend is very likely to prolong itself in the foreseeable future, because of the ocean warming due to climate change, and is going to alter the whole Indian Ocean, with the risk of turning this biologically rich ocean into an “ecological desert” (Amantha Perera, “Warmer Indian Ocean could be “ecological desert” scientists warn”, Reuters, 19 January 2016). This means that the decline of marine life due to anthropogenic climate change is a direct threat to the food security of the whole western Indian Ocean ecosystems, thus to the lives of the populations of eastern African societies – i.e South Africa, Mozambique, Tanzania, Kenya, Somalia, Ethiopia, as well as archipelagos, as Comoros, Maldives, Seychelles, Madagascar, Mauritius, Mayotte – and to their economies (Johan Groeneveld, “The Western Indian Ocean as a source of food”, in WIO Regional state of coast report, UNEP, 1 May 2015). This is most likely to happen despite the rapid development of fish farming, which induces its own cascade of issues (Michel and Sticklor, ibid). The plankton and sea food crisis is particularly worrisome given the profound economic and social inequalities known by the region, and by the political, confessional and military tensions that arise, for example in Kenya and Somalia (Hélène Lavoix, “At War against the Islamic State – A Global Theatre of War“, & “At War against a Global Islamic State – Facing a Strategic Trap in Somalia?“, The Red Team Analysis Society, 23 Nov & 14 Dec 2015). This means that, nowadays, a giant biodiversity and geophysical crisis is unfolding on such a scale that it concerns numerous countries and dozens of millions of people at the same time, and combines itself with political and strategic current crises. 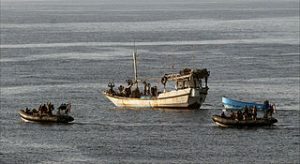 One has to recall that the rapid development of Somali Piracy stemmed from the decision of Somali fishermen communities to adapt to the marine life depletion of the Somali economic exclusive zone (Andrew Palmer, The New pirates, Modern global piracy from Somalia to the South China Sea, 2014). to divert some of their Navies to the region, integrating their naval forces, for example through the “combined task force 150”, to fight back at the pirates, which “are part of some of the poorest people of our world, inhabiting a devastated and highly peripheral country, … at a centre of the maritime traffic” (Valantin, “Somali Piracy: a model for tomorrow’s life in the Anthropocene?”, The Red Team Analysis Society, 28 October, 2013). Furthermore, the plankton is “only” one signal among others of changes, as is the multiplication of extreme weather events linked to climate change. For example, in November 2015, Yemen, located at the northern part of the Indian Ocean, was hit by two hurricanes, which intensity and frequency were totally unprecedented in this region (Adam Sobel, “Rapid fire cyclones over the North Indian Ocean”, State of the Planet, November 5, 2015). Their violent effects on populations and infrastructures combined with the consequences of the war between Houthi rebels and the forces of the president in exile and the Saudi military (Andrea Thompson, “Yemen sees unprecedented Tropical cyclone double-whammy”, WX Shift, 10 November 2015). Among other consequences of the warming of the western Indian Ocean is the continuous rise of the sea level, which is threatening to destabilize the way of life of the 60 million strong coastal populations of the Western Indian Ocean rim and their infrastructures (“Global warming effect on extreme Indian Ocean dipole: what it means for Africa”, UNDP Climate Adaptation Network, June 16, 2014). In other terms, this whole region is being “immersed” in and saturated by the rapid change of its environmental, demographic, economic, political and infrastructural conditions in a way that may not be sustainable for long. The main political and strategic issue that this situation induces is to wonder what kind of response the coastal populations of the gigantic western Indian Ocean rim will be and if it will be possible to avoid the rise of armed, violent and predatory types of adaptation to the new conditions emerging from the Anthropocene, involving not a few thousands desperate Somalis, but millions of people? In other words, will the Anthropocene be an age dominated by armed competition? Or will the political authorities of countries “sharing” the emerging giant eco-geopolitical crisis be able to anticipate these new situations and to coordinate common responses and policies adapted to a “management” of the Anthropocene? 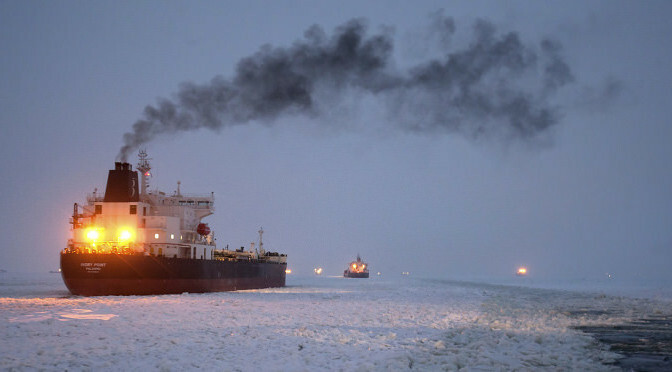 Featured image: Vaigach nuclear icebreaker leading ships through Gulf of Finland”. 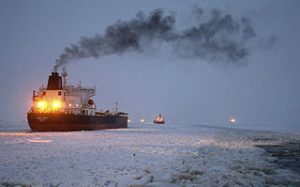 A caravan of ships being led by the Vaigach nuclear powered icebreaker through the Gulf of Finland. – RIA Novosti archive, image #872759 / Vadim Zhernov / CC-BY-SA 3.0, via Wikimedia Commons.